Daddy-O! - "The Way I Walk"
Wewecan Records is a small distributer of locally produced, independent, roots music from the Southcoast. ALL proceeds from sales go directly to the artist(s). We hope you will support real music by purchasing and enjoying their recordings. The 4th and latest album from Daddy-O! Double-Album on One Disc! 25 tracks of Rockabilly, Rock & Roll, Doo Wop, Swing, Country & more. New songs by RC & Brenna. click the Buy Now button to purchase the Daddy-O! CD, "The Way I Walk" through PayPal. 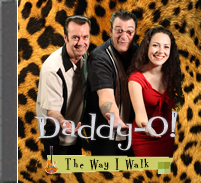 CDs can also be purchased at any Daddy-O! performance.